This tour is also available as a shorter 15-days trip. Click here to learn more about this tour. Phantastic and untouched Landscapes covered by tropical forest and a matchless density of Ethnic minorites are the key features of the region known as the “Golden Triangle” which covers parts of southern China, northern Laos and Thailand and is connected by the Mekong. 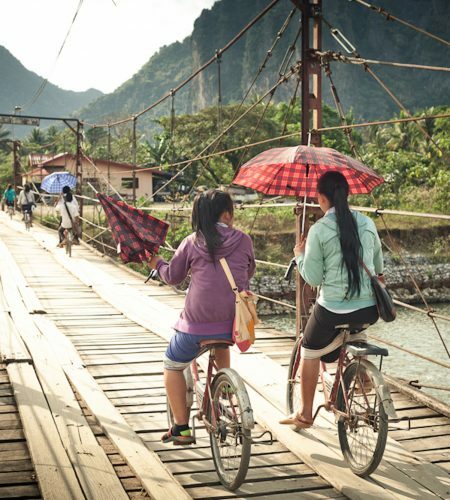 Our route will lead you from Jinghong in South Yunnan through a natural reserve in Luang Namtha to beautiful Luang Prabang. From Lao’s ancient imperial capital we take a chartered boat upstream, traveling two days on the mighty Mekong to the Thai border-town Chiang Khong. After three more days of cycling in Thailand and a boat trip on the Kok river we spend the last two days of our tour in Chiang Mai. On our last cycling stage in Laos we follow the Ou River downstream until it reaches the Mekong. Located beautifully at the banks of the mighty river lies Luang Prabang. Our hotel is an old colonial Building which is built in a combination of french and laotian architectural styles. It is located right next to the Mekong, close to the centre of the historic city. Today you will have free time to relax and take it easy. You can enjoy some cake and coffee in one of the city's pretty cafés, go shopping for souvenirs or explore a few more of Luang Prabang's numerous temples and atmospheric little streets. Since thousands of years the Mekong has been the source of life for the people living in this region. For the next two days, we go on a cruise 300 km upstream, staying overnight in the town of Pak Beng. On the second day our spacious chartered boat takes us all the to Huay Xai, where we cross the newly built bridge to Thailand in the afternoon. On the Thai side of the river lies Chiang Khong, where we stay one night in a Guesthouse at the riverside. On our first stage in Thailand, we cycle mainly on quiet side roads to reach Chiang Rai in the late afternoon. From Chiang Rai we take a small boat to drive up the fast currents of the Kok. On the way we can stop to visit a village of the Karen or Akha minority. The last few kilometers to Thaton we once more travel on our bicycles. Today's cycling once more features fantastic landscapes: After lunch, the road winds up the hills and runs through areas covered by Thailand's native forest. In the afternoon we arrive in Chiang Dao. On our last proper cycling stage, we avoid the main road to Chiang Mai as much as we can, cycling through villages and fields on flat terrain. In the evening we go for stroll over Chiang Mai's night market and try some of the local specialities. As our last venture, we have the option to cycle up to the famous Wat Phrathat Doi Suthep, which lies just outside Chiang Mai on a hill. Doi Suthep is hailed to be one of Thailand's most beautiful temples and features beautiful views on Chiang Mai and its surroundings. Farewell dinner in the evening. Individual return journey from Chiang Mai.